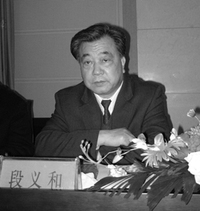 On this date in 2007, former senior Chinese lawmaker Duan Yihe was executed in Jinan along with the policeman nephew who had helped him spectacularly assassinate Duan’s mistress just two months before. Taking up with a teenager 30 years his junior must have been an appealing perk of the job when Duan Yihe was a rising official in the early 1990’s. Fast forward 14 years, and he’s in for several cars, a couple of apartments, and tired of the now 31-year-old Liu Haiping, who’s blackmailing him for more. Much less appealing. Why, detonate a remote-controlled explosive in her car. “The blast was so powerful that her Honda sedan was ripped apart, her lower body was destroyed and her torso landed 30 metres away,” reported The Times. The case helped crystallize growing official concern with the corrupting potential of senior officials’ ubiquitous mistresses. The day before the car-bombing, the Chinese Supreme Court issued a ruling extending anti-graft laws to mistresses. The method of execution (either gunshot or — more likely — lethal injection) was not publicized.